I have sat on this review for some time. Running Wild is a long time favorite band of mine, so I did not want to rush to judgment, writing a review without giving the album enough time. Well, I've had enough time, and I have determined that the best days of Running Wild are clearly over. While I first praised The Brotherhood, I would now quote that album some 20-30 points below my original score. I learned from my mistake on that review (one of the first that I did for this site). That is why I have given this album time to resonate in my mind, allowing time to form a firm opinion in my mind. Some would argue that Running Wild started to slip off the cliff after Black Hand Inn. 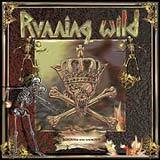 While I would agree that Running Wild haven't released anything better than BHI as they progressed through the 90's and into the new millennium, The Rivalry is a kickass album, with Masquerade holding up quite well for me also. Like I said, I have realized that The Brotherhood has a handful of cool tracks, but its programmed drums and excess of mid tempo filler material represents a serious slip in quality. Although Rock 'n' Rolf credits tour drummer Matthias Liebetruth for the drums on this album, the drums are again programmed…Ughhh! I have to start this off by mentioning a couple aspects of this album that I really like. The production and mixing is at its best on this album. I like the fact that each element of the sound is well balanced and crystal clear in terms of sound quality. The guitars simply sound outstanding, with the soloing and background shreds really coming to the forefront of the sound. It's too bad that there aren't that many galloping riffs to take advantage of the excellent sound quality found on this album. I knew things weren't looking good when I gave the album it first spin, and heard a filler track in the leadoff spot. Draw The Line is fairly representative of a good portion of the album. It is a mid tempo cut, completely devoid of energy and emotion. The programmed drumming drains any life out of this song that may have otherwise existed. I have no idea why Rolf decided to go with programmed drums instead of a real, live drummer 100% of the time. If he thinks this option is better than having the likes of Jörg Michael pounding the skins, he is sorely mistaken. Like I said, the programmed drum sound manages only to strip the music of personality, excitement, and becomes extremely repetitive by the fourth or fifth track. Even the good songs on this album have a stale, lifeless tone in some form because of the programmed drums. I don't think it's an overstatement to say that Rolf is digging his band's grave with this choice. Compared to the material that the band has written in the past, this material just isn't in the same ballpark in terms of quality. Gone for the most part is the speedy tempo. Gone are the catchy riffs. Gone are the addictive hooks that had me sold on the band's shift towards mid tempo songs over recent years; these mid tempo songs are just sterile and lifeless. As the album progresses, I struggle to differentiate from song to song. Aside from hearing nearly the same damn drumbeat the whole album, the songs for the most part lack creativity to keep me coming back. There are some exceptions, however. Angel of Mercy, however, is a speedy and catchy cut that does justice to the best of the band's many pirate hymns we've heard over the years. Skull and Bones isn't necessarily a speedy cut, but it certainly contains infectious guitar work and chorus lines that stay in my mind long after the album has finished playing. Although the band took some heat for shifting more toward a mid tempo style in recent years, I never objected to songs like this. Unfortunately, most of the other mid tempo songs on this album don't share the quality of Skull and Bones. As I said earlier, the guitar work throughout the album is excellent. I can't say enough about the general guitar tone of this album. Additionally, I have no complaints regarding the solos and shredding; they are in fine form. As I said earlier, I do miss the catchy, driving riffs of the past. They are all but gone completely. Aside from the two aforementioned tracks, none of the remaining songs stand out to me at all. Instead, the band flounders in mid tempo mediocrity the rest of the album. There aren't any mistakes, and the guitar work is great, but this alone doesn't make a great song. I know that I've pounded on this subject, but the programmed drums further enhance this mundane, repetitive, and boring feeling. Compared to many bands putting out music these days, you can't really say that any of these songs are bad. However, it is pretty easy to conclude that they are average at best, especially when you listen to the material this band has produced over the last 20 years. The final track, The War, is a ten minute track that seemingly tries to duplicate the ten minute + epic (which was actually pretty good) from The Brotherhood. Unfortunately, The War ends up a 10 minute borefest, unlike it's predecessor, The Ghost. The hardest part of being a reviewer is writing a negative review of one of your favorite bands. However, as a reviewer, I have to try my best to avoid any "fanboy" spin or overquoting, and be as objective as possible. Having been a fan of this band for years, and having stuck with them through recent years when their fan base has largely vanished, take the following for what it's worth: I've listened to this album over 20 times now. I find it very, very difficult not to stop listening after about the sixth track. That has never happened to me with a Running Wild album before. I sincerely hope that the band can right its course with their next album and produce at least a good album. I know the masterpiece days of the band are long gone, but how about giving us at least a good album? In all seriousness, the programmed drums have got to go. This facet of the sound could very well be the nail in the coffin for this band. The sterile, lifeless drums really flat lined any impact any of these songs could have had. And with that, Rogues En Vogue will sail back into my CD cabinet, likely to collect dust while albums such as Death or Glory, Blazon Stone, Black Hand Inn, The Rivalry, and other greats from the band catalogue get regular play in my stereo. I expected more from a band that has released these great albums.